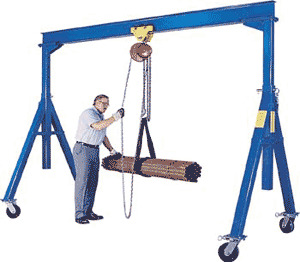 Industrial Steel Gantry Cranes are designed for transporting and positioning materials. Solid steel construction will provide years of service. Choose from a variety of sizes. 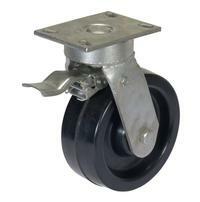 Large 8" diameter 4 position locking swivel phenolic casters with roller bearings will facilitate easy mobility from one area to another. More economical and flexible than permanent cranes. Features quick setup design. 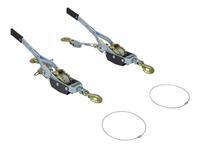 Order optional Lever Ratchet for easy one-person height adjustment (Model V-AHS-KIT). Height is adjustable in 6" increments. Blue finish. Hoist and trolly sold separately. Usable distance between uprights is overall beam length minus 12"
Usable trolley travel length is overall beam length minus 20"
Note: All products should be inspected frequently to insure safe operation. Final testing and inspection is left to the end user after final assembly has been completed. For further details see ASME B30.7.